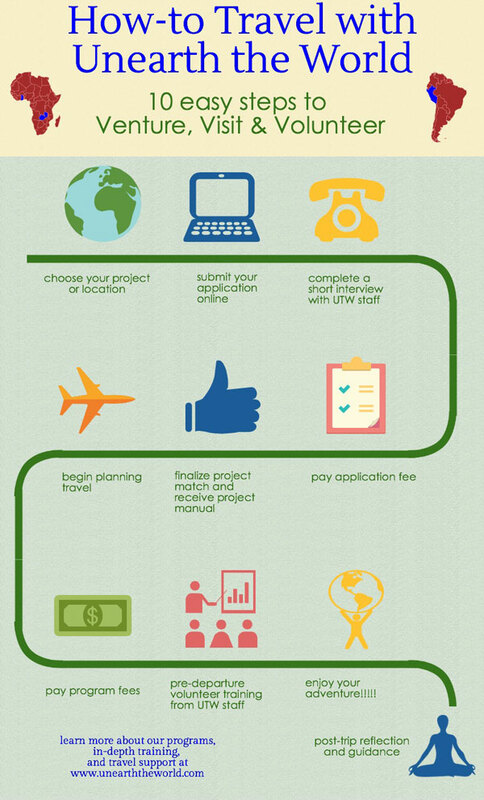 Submit your application online – Unearth the World will respond to your online application within 72 hours and send you an email confirming the receipt of your application and requesting a phone interview. Short interview with Unearth the World staff to discuss intentions and confirm/finalize project availability. Pay application fee – Once volunteer is accepted into a project, they must acknowledge and sign the Unearth the World Liability Waiver and Code of Conduct and pay $500 application fee. Finalize project match and receive project manual – Once application, payment, and forms are received, volunteerss will receive a confirmation letter via email and project manual to aid in guiding preparation. Volunteers will schedule a date and time for pre-departure training with an Unearth the World staff member. Pay program fees – If the start date of your placement is more than 120 days away, then the program fee is due at least 90 days before your start date. If the start date of your placement is less than 90 days away, then the program fee is due right away with your application fee. Pre-departure volunteer training – Complete pre-departure training at least 2 weeks before departure. Training includes self-led modules and a phone call with Unearth the World. Post-Trip Reflection and Guidance – After your trip, it is important to reflect on your experience and strategize on how to incorporate your project into your normal life. Post-trip reflection includes independent work, an Unearth the World survey, and a 30-minute call with Unearth the World. More Questions on how to volunteer abroad? ?